Let us be honest. No one actually knows what is going to happen on February, 17, 2009 - the date of the digital transition. Experts having been proclaiming a smooth transition both for Cable TV subscribers as well as the 20 million non-cable, non-satellite TV viewers. But there are signs indicating that these predictions were somewhat optimistic. Biro Engineering anticipates greater disruption in the DTV services than government agencies have acknowledged. A typical example is the future (Digital TV) reception of Channel 7, Boston, WHDH-DT, in Hillsborough, NH, located within the Grade “B” contours of Channel 7. Boston. The CATV system’s 150’ high antenna tower has a Channel 7 antenna installed at 100 ft above ground, receiving good quality analog Channel 7 signals from Boston, at a distance of 63.2 miles. Will the same receiving antenna ascertain the reception of reliable, interference-free Channel 7 digital pictures as well? Sadly, no. Here is the problem. 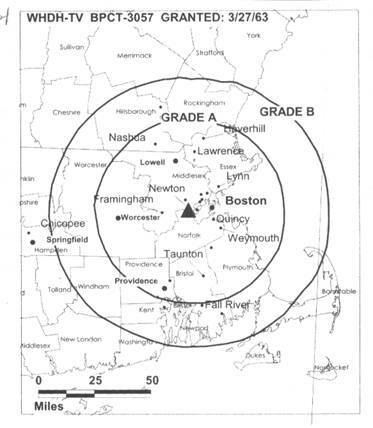 While the analog Channel 7 transmitter currently broadcasts with 316 kW effective radiated power, Digital Channel 7, WHDH-DT, Boston is licensed to 15 kW. This is equivalent to 75 kW analog output, representing a reduction in power of 4.2x. Can the digital station with such reduced power come close to replicating the service area (Grade “B” contours) of analog Channel 7, Boston? Sadly, no. Projections were made and computer aided signal strength calculations performed, with testimoney supported by $2,000/day broadcast consulting engineers, but nothing can replace an on-site verification survey. This kind of testing is difficult to accomplish in September, 2008, when the digital transmission starts only on February 17, 2009. So what are the options of the CATV head-end engineer? Don’t make any changes, use the current Channel 7 antenna, and hope for the best. Order a quad of Channel 7 Yagis, and still install the new array at the top of the tower. Explain to management that the application of an antenna-mounted low noise preamplifier is impractical, due to the cell phone and mobile radio transmit antennas permanently installed at the top of the tower. Pay to receive the Channel 7, Boston signals by satellite, an approach which is not free. Charging your subscribers in a competitive market with the additional expenses is a non-starter. While the FCC did firmly establish the February 17, 2009 deadline, the agency will also consider stations’ request to operate the digital facility with less than full power until August 2009. So even if you incur the expense to buy new antennas and relocate items on the tower, you still might not have enouh signal for 6 months! In case the picture quality further deteriorates, whom will the unhappy subscribers blame - the FCC or the Cable TV company? Should the Hillsborough head-end engineer indeed experience difficulties with their Channel 7 digital reception, February in New Hampshire is not the best time to work outdoors on the top of an antenna tower. Pulling the switch on full power analog TV stations across the land at once, practically in the middle of winter, allows no adequate time to conduct trial runs, no time for on-site DTV reception verification surveys, no way to discover and iron out unanticipated reception troubles! The case of digital Channel 7, Boston is not unique. There are many similar digital situations in the country, requiring expert technical advice and on-site reception verification testing. If you think that the US Digital Transition starts February 17, 2009, reconsider this information. The Digital Transition actually starts 5 months ahead, on September 8, 2008, thanks to the Wilmington, NC commercial television stations, who agreed to shut down their analog operations five months ahead of the national DTV transition date. The admirable objective was to ease the digital transition, discover DTV reception anomalies, and make last minute changes and modifications, if necessary. This pioneering spirit of North Carolina broadcasters is highly commendable, except for the slight issue of the selection of the service area. Is Wilmington a typical American DTV service area? We have our doubts. 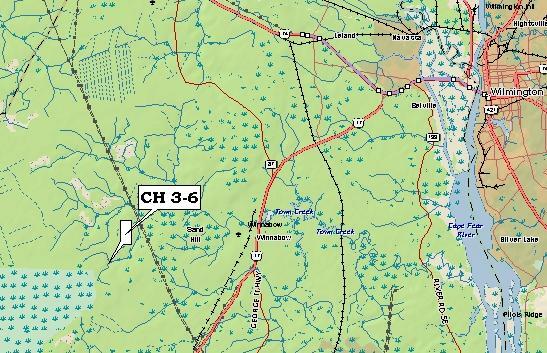 The land is perfectly flat, dotted with swamps and lakes, as displayed on the topo map below. The stations’ 1800 ft high transmit antennas, aided by the ground’s above average conductivity, will produce over-optimistic signal strength readings. The reality is that we need to know real world DTV reception conditions and apparently this carefully selected test market does not qualify for that. Why only one, pancake-flat test-market? Why not three, five or more test areas in Colorado, Oregon or the Appalachian Mountains? The Cable TV industry should be on the look for fresh FCC initiatives.